We have Seven Cats (and two dogs) which makes us “Cat Wranglers”. 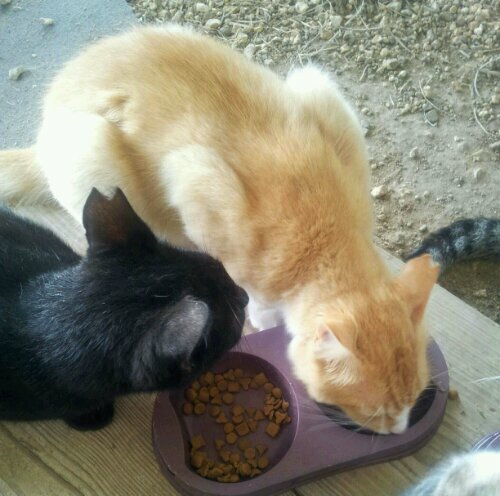 These cats are ferrel, and after two years, I can barely touch them. Oh, they love The Wife, she can pet them and scratch their bellies and they run to her when she comes outside. I get quiet indifference. But the purpose of this post is to tell all a yall that I think some of our cats are really pigs, namely the males. We have 3 males and 4 females and they all get one scoop twice a day. The males woof theirs down, then try to steal the rest of the ladies dinners. So lately, I’ve been trying to stop this from happening. When the males finish first I try to prevent them from stealing the girls’s food. I just put my hand out and catwrangle them and try to stop them from pushing the ladycat out of the way.